Fear the Walking Dead concluded its fourth season with even more contrived coincidences, some baffling character choices, and surprisingly low stakes. 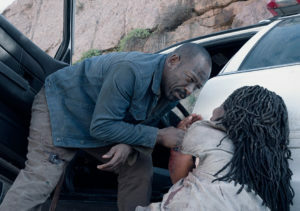 Morgan’s inclusion in this series excited me at first because he is one of my favorite characters on The Walking Dead. But the whole second half of the season was in service of his character arc, of realizing that he needs other people and that he cannot continue living in the world alone. Compelling as this is and as moving as Lenny James’s performance has always been, it feels like familiar territory since he already came to this realization on the main show. And the writers have been forcing him into making crazy decisions for the sake of unwarranted compassion. H e is determined to save Martha after all the suffering she put them through, and even if she went ahead an endangered him as well. He only changed his mind after he learned that she had (inadvertently) poisoned all of his friends. It had to reach that point before he finally let go of his ridiculous crusade. There are so many other people out there more worth saving, Morgan. Martha in the end was also a bit of a disappointing antagonist, and as other reviewers have mentioned, it is probably because we did not spend too much time with her and so she felt like she was tacked on to the show just to add some conflict. She never really made much of an impact on the show as previous villains, and the fact that the group had many chances to get rid of her or to just leave her on the side of the road, was plain frustrating. 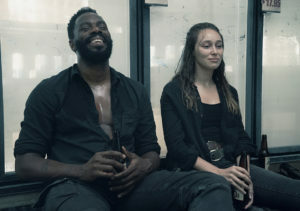 One of the Fear the Walking Dead’s flaws this season was not just killing off significant characters like Nick and Madison, but introducing so many new ones and spending more time on their character development at the expense of the remaining original cast members like Alicia and Strand. I have grown fond of John Dorie and June and even Althea. Wendell and Sarah are interesting enough but they’re still rather new. And because of the growing cast, we don’t get to see Alicia and Strand do much when Alicia, as the last remaining Clark, could be taking a more prominent role in the show. Hopefully, the next season will rectify this. Then, even though Morgan’s plan at the beginning of the second half of the season was to reunite with Rick and the others in Alexandria, bringing everyone along for the ride, he chose not to do it. As frustrating as it was to be teased a crossover with the main show, this was a necessary story choice as the next season of The Walking Dead will be starting with a time jump. 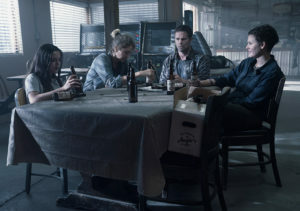 Considering the time jump already made on Fear the Walking Dead this season just to accommodate Morgan’s arrival, we will need to keep this group busy before they can catch up with Rick and the others. So, they decide to stay together and continue sharing supplies with any survivors who might need help. The writers surely wanted to the show to end on a hopeful note, and there’s nothing wrong with that even on a show set in such bleak circumstances. But the impact of all this has been diminished by all the contrived conflicts, the coincidences, the implausible geographical intersections, and the unbelievable range and battery life of those walkie-talkies. Here’s hoping Fear the Walking Dead season five will put the show back on track.